With over 500 million daily users, Instagram offers a great platform for brands to engage their audience. Recent studies show that the engagement dividend brands stand to gain from this platform is much more than on other social networks. However, marketers often struggle to find the right content for this visual-first platform. This infographic is a selection of 23 content ideas which have had considerable success in 2017. Using a data-backed approach, we look at engaging types of content along with typical examples of each type posted by brands on Instagram. It also outlines which content types are suited to a particular industry. The discussion of best practices for each content type provides marketers with more actionable insights. This infographic can serve as a starting point for marketers trying to create relevant social media content. These engaging content ideas can be developed further to suit any brand’s social media goals, tone, messaging style, principles etc. The content ideas presented in this infographic were derived from Unmetric Discover, a catalog of over 500 million pieces of branded content. 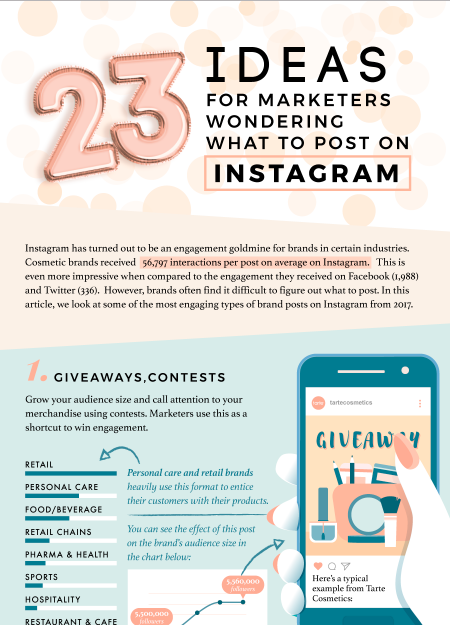 The examples and statistics used in it focus exclusively on US-based brands on Instagram.